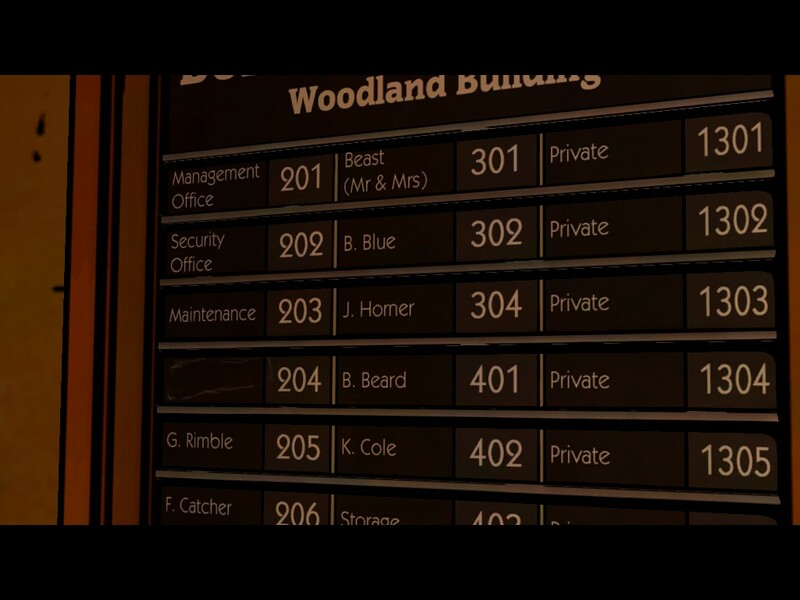 We’re all big fans of Telltale at BLHQ. Sure, we either fell out of their good graces for a while or they fell into our spam folder for a while, but regardless of which it was, I’m glad to say that we’re back with another review. 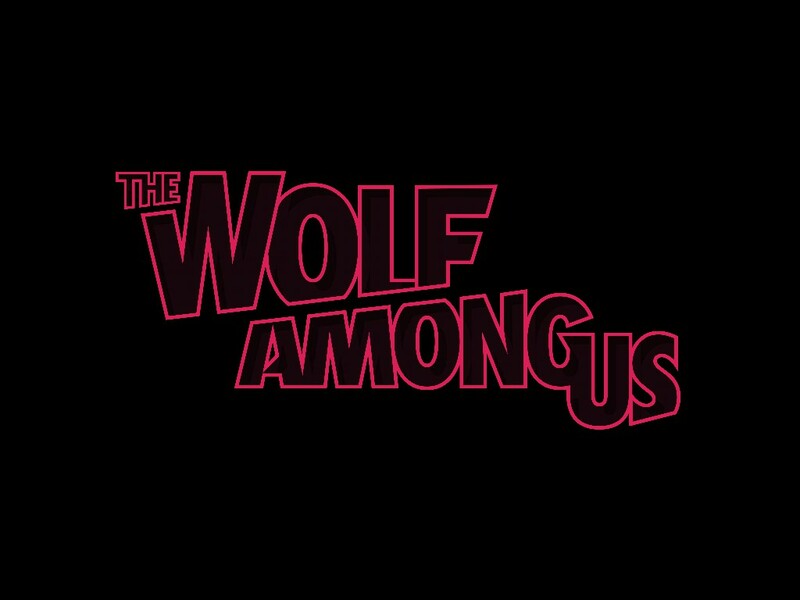 This time it is their latest episodic, The Wolf Among Us. 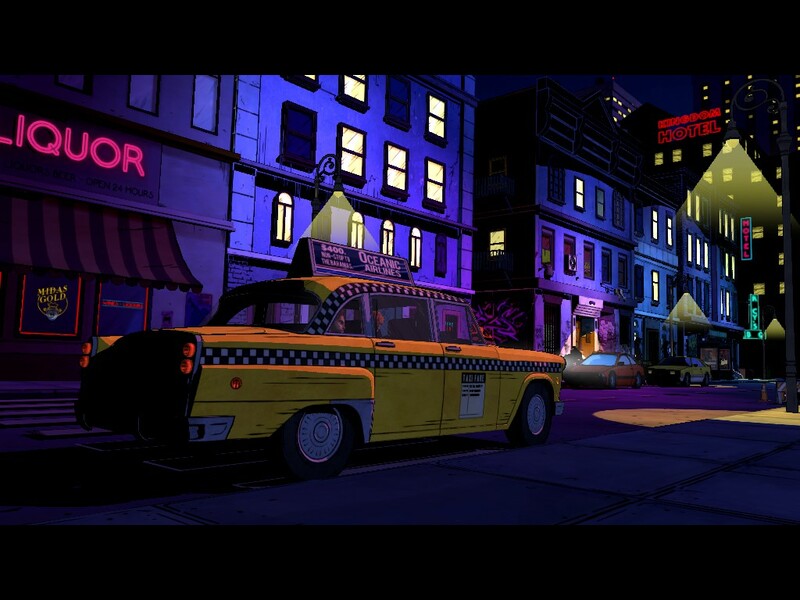 This adventure game based on the brilliant “Fables” series of comics takes a noir-ish look at the decidedly non-fairy tale lives of fairy tale characters in New York City. 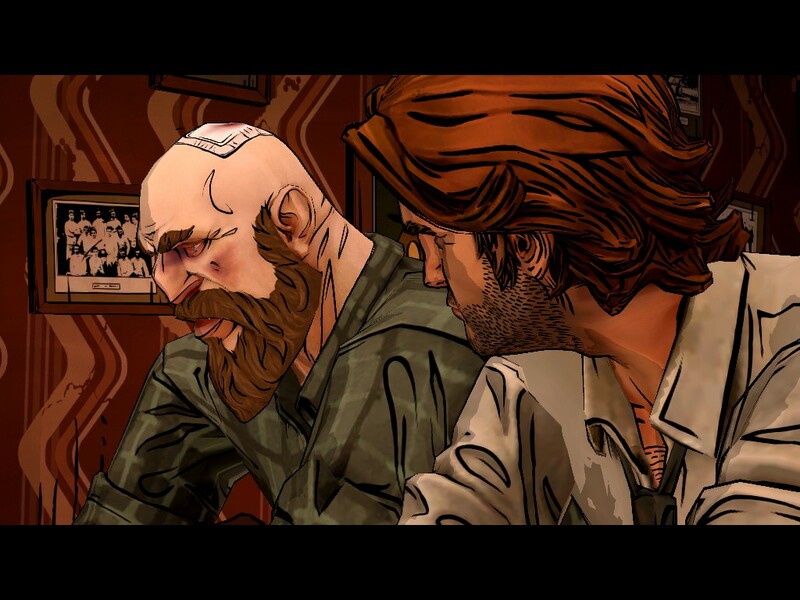 In a strange coincidence, The Wolf Among Us makes similar graphical decisions to our last review, Cognition. An effort has been made to capture the strong, bold colors and sharp contrasts of the comic medium, but pull them together into a 3D world. 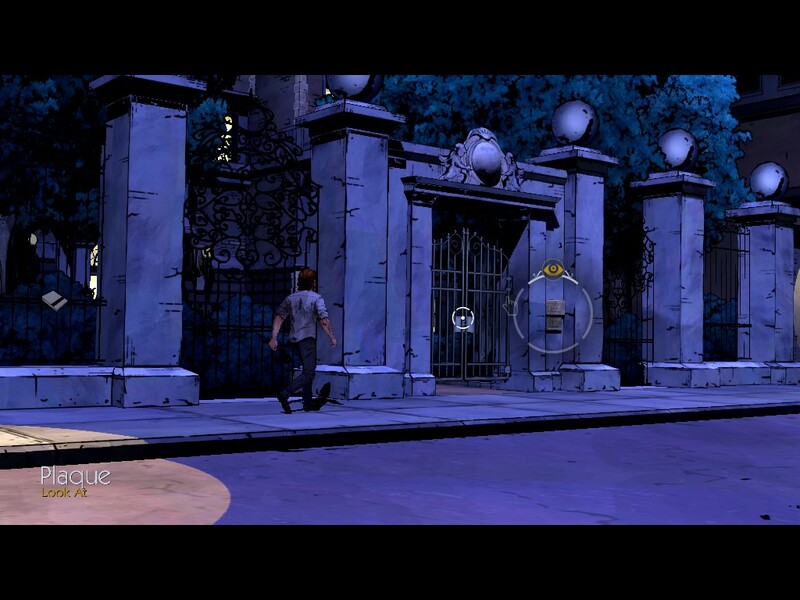 Telltale succeeded brilliantly here. Ink lines trace out the features and expressions of the characters, adding unmistakable expression to their faces. Due to the world the story takes place in, the cast is extremely varied, and allows for some superbly creative character designs. Frequently you’ll get two different representations of the same character, once as their fairy tale self, and once as their seemingly human form thanks to glamour spells. 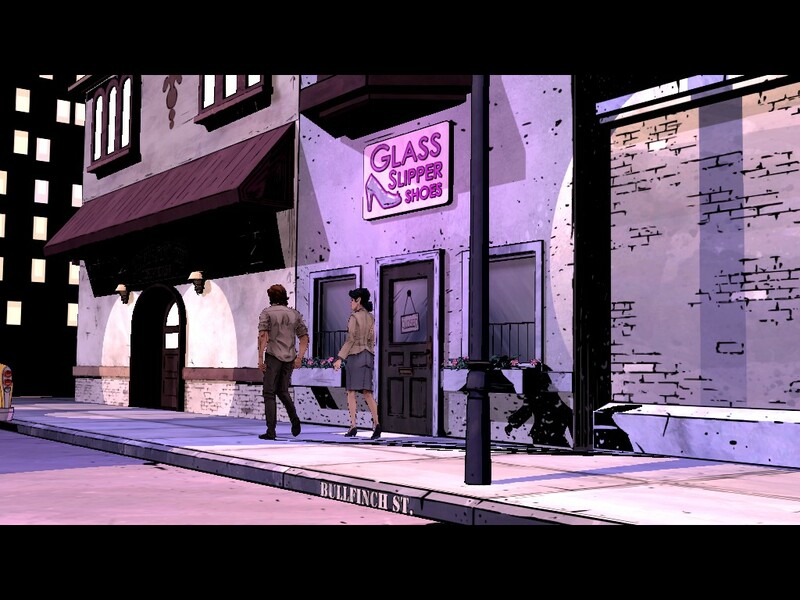 Unlike Cognition’s hit-or-miss animations, The Wolf Among Us has much more fluid motion, and the attention to detail is exquisite. 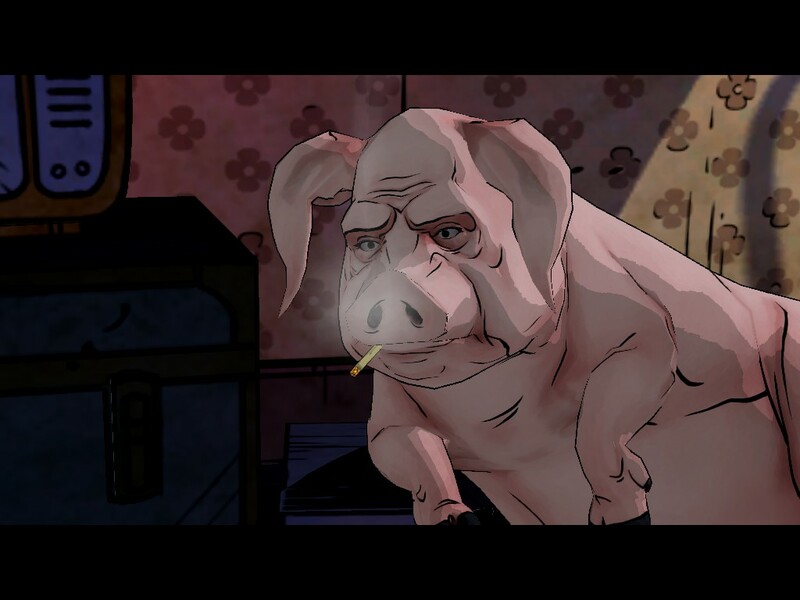 Bigby Wolf, our ‘hero’ is a heavy smoker (Huff and Puff brand cigarettes, get it? ), and the animators not only have him pop a cigarette from the pack with a nifty little tap, they remember things like having him subtly flick the ash from the end. When he’s been in a fight, his raw red knuckles linger. Detail drips from every visual aspect they could slather it on. Even the UI is slick and snappy. The camera bobs along in a hand-held sort of way, and hot spots float along on the screen like a cross-hair, bringing up the contextual options when you mouse over them. 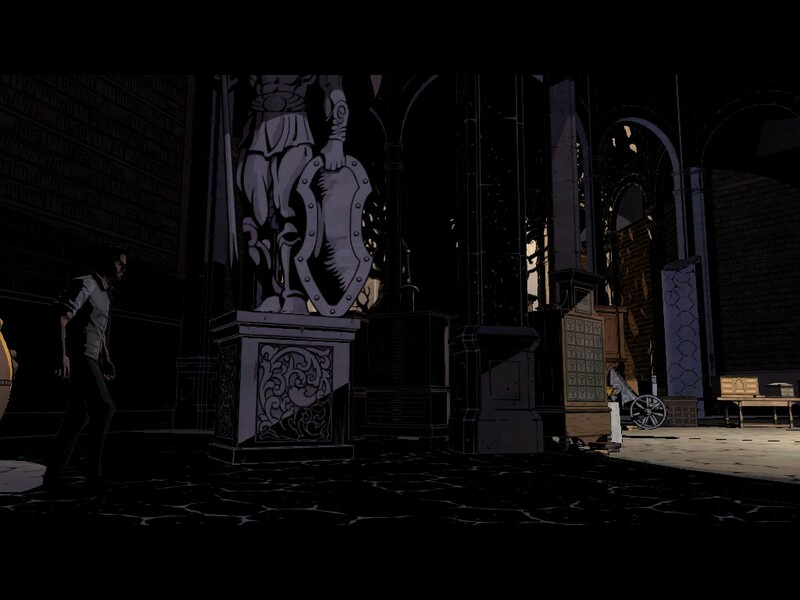 In short, The Wolf Among Us has a fantastic and functional visual style. 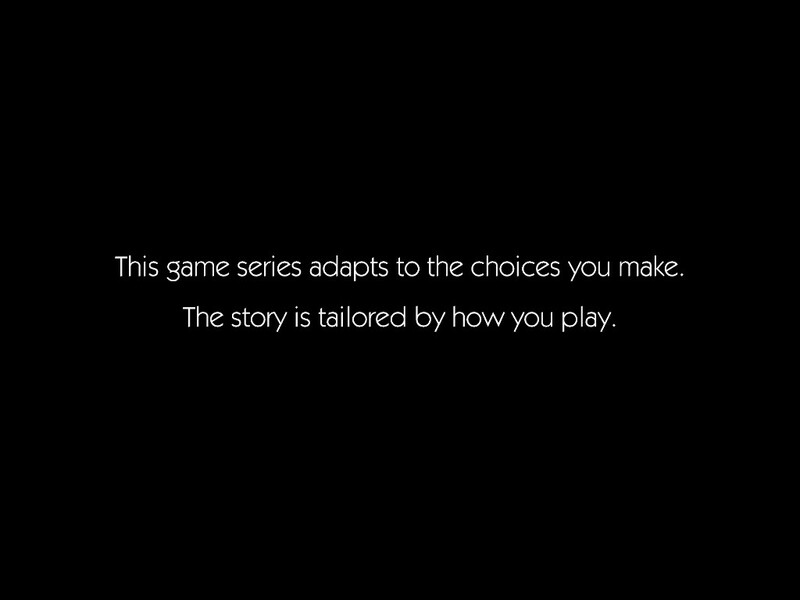 This is ostensibly an adventure game, but it comes at the genre in a very different way than the classical approach. I’ll admit that I’m not among the roughly 148% of Americans who has become enamored with The Walking Dead in its various incarnations, so I didn’t get my hands on Telltale’s masterpiece of interactive storytelling in order to compare it to this. Thus, what I call unique in this game’s mechanics may actually have originated there. That said, this game focuses more on the type of player you are than it does on what you’ll need to do. At its core it is a mystery story in a complex and well established world. You interact with the scenes in much the same way you might in any adventure game, looking for hot spots, investigating them, interacting with them, or combining them with your inventory. When it comes to interacting with the people, however, things change. And I mean that literally. You have a limited amount of time to choose your replies to each bit of dialogue. You can be a crude, violent ruffian like they expect your to be, a by-the-books working stiff, or something quite close to a compassionate lawman. You are given the ability to make promises, and later given the option to break them. Characters remember what you did, and act accordingly. 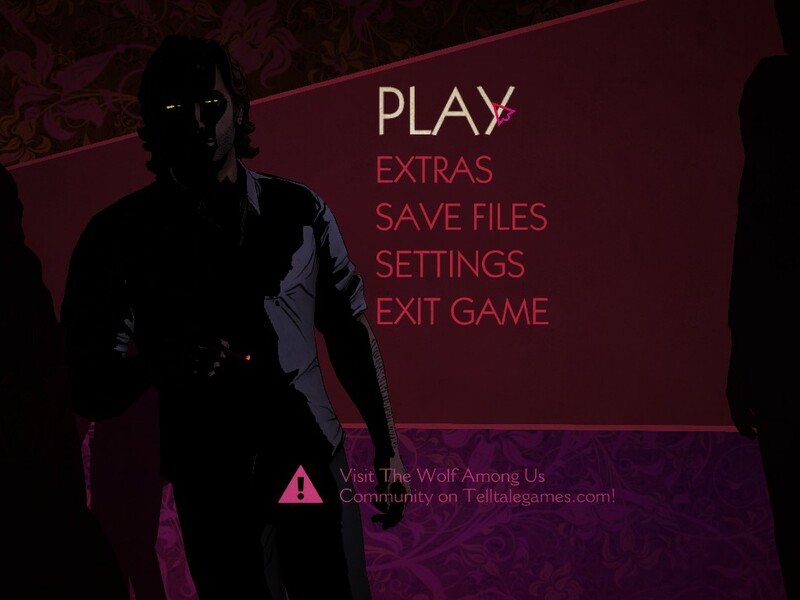 A brilliant decision that Telltale had was to put a little ominous tool tip at the top of the screen when something has had a consequence. Seeing “he will remember that…” at the top of the screen did more to hammer home the eventual cost of my behavior than a sudden punch in the face ever could. Moments before a rundown apartment suddenly got a lot more rundown. Speaking of punches in the face, the game breaks up story and investigation sequences with Quick Time Event fights and chases that, to my surprise, I didn’t hate. Once I was aware that I’d be clicking and hammering buttons, I found the sequences to be thrilling. They were cinematic in their staging, and really added a level of impact and urgency to the game, helping the pace and keeping me on my toes thanks to the suddenness with which they could occur. The episode itself is pretty short, but by virtue of the choice system causing branching and multiplying changes in the plot and puzzles, there is an incredible amount of replay value. 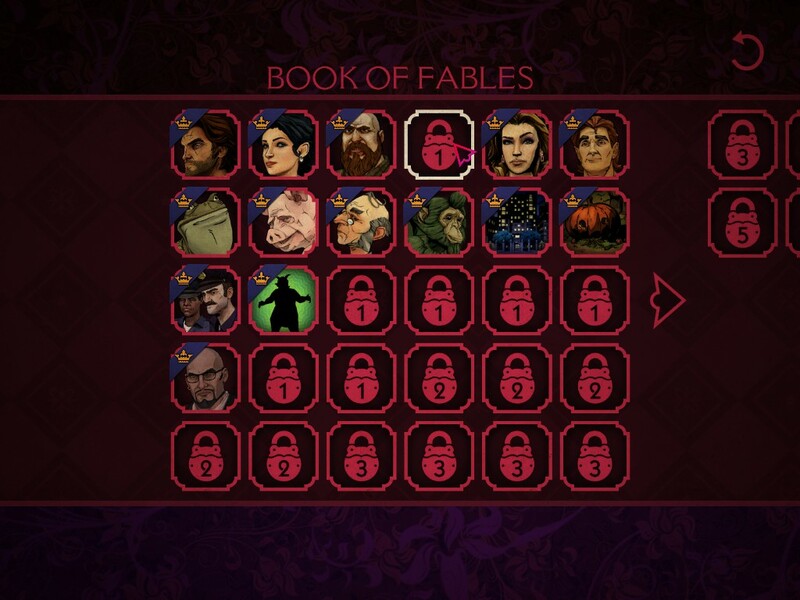 You even get neat little dossiers on the fairy tale folk as you encounter them, giving you a stack of extras to sort through and attempt to complete. I really got a kick out of it, and I’ll probably play through again just to see where a few different tactics and decisions might have taken me. If there was a weakness, I guess it would be that this time around there wasn’t really much to solve, though I did get a little jolt of sleuth-y pride at noticing the clues and connections between them. Like all Telltale games, the casting is strong, and the performances are good. 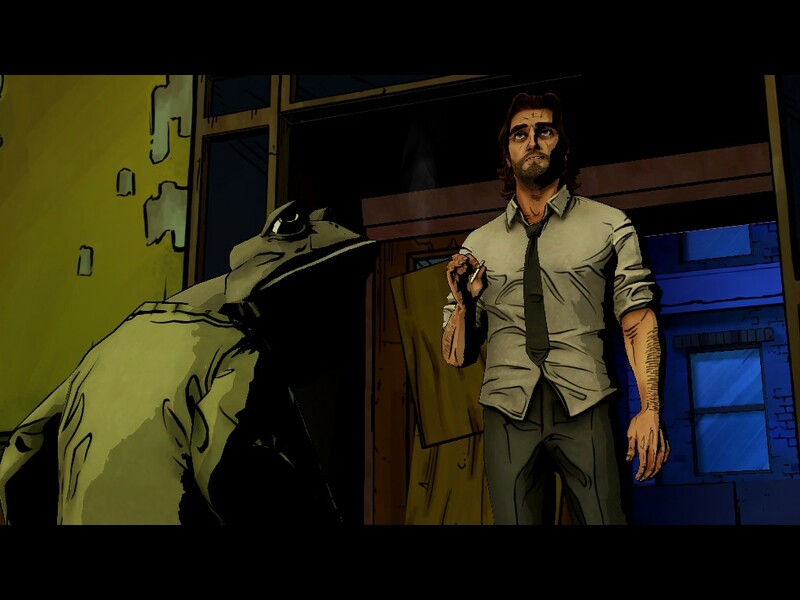 Bigby is a gruff, film noir gumshoe with a voice to match. Mr. Toad speaks in a cockney worthy of a Guy Ritchie movie. Snow White has a capable but naive quality to her. Even minor characters (though in an episodic, who’s to say what characters are actually minor) put forth strong performances. Though I’ve never read the Fables comics, I’ve been fascinated with the concept ever since I first learned about them via TV Tropes. If you’re not familiar, here’s the rundown. There exists a world where the characters of our fairy tales live and thrive… or at least, where they used to live and thrive. This place is referred to as The Homeland, and our cast of characters are refugees of that world who migrated to our reality after something called The Exodus. They live among us by carving out little pieces of the world to mask with spells and illusions, and struggle to live semi-normal lives. One such place is a neighborhood in New York City called Fabletown. The problem is that the old animosities die hard, and if ever everyday people like us (called “mundies” by the characters) were to take a real interest in the goings on within Fabletown, the illusions would fail and things would come to a sudden and messy end. 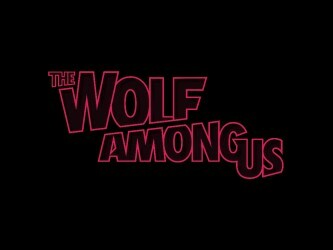 Thus, our hero Bigby Wolf (The glamour-disguised Big Bad Wolf of Red Riding Hood and Three Little Pigs fame), has been appointed sheriff of the community, charged with keeping order among them. Hey, aren't you supposed to be on the wall? 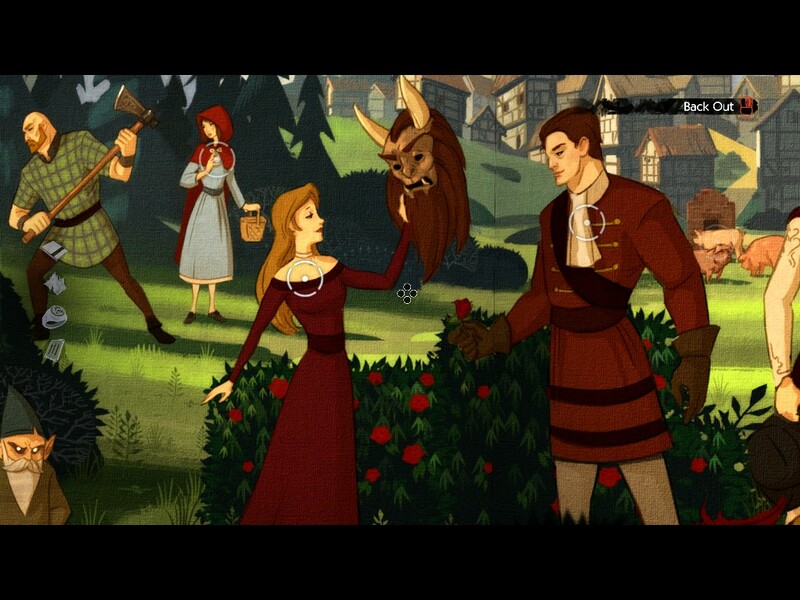 Now, if all of this sounds like it might be a cutesy and childish premise, then chances are you’re not too familiar with the works of the Brothers Grimm. These stories are violent, blood-soaked parables; a far cry from their Disney-fied modern depictions. Within the first few minutes we’re treated to prostitution, violence against women, and an ax to the brain. Lot’s of cussing, too. 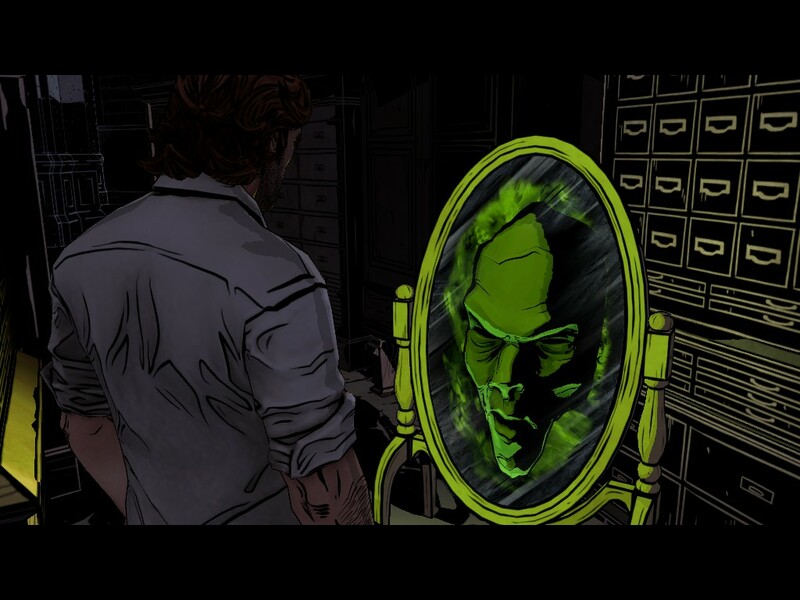 Bigby was the villain of many of these tales, after all, and the victims and heroes he faced are none-too-swift to trust him despite his position of authority. Episode one follows his investigation of a report of violence, and eventually the murder of one of the participants of that little spat. The trail of evidence and testimony weaves through Fabletown and is never even remotely obvious, forming an intriguing web of clues and deceptions that you need to work your way through via trust, intimidation, or violence. The decision aspect of the gameplay works phenomenally well with the story, building dynamic and logical relationships between characters. By the end of the episode, I found myself fretting over every decision, worried about how characters would behave and realizing that there was no way to make everyone happy. I cared enough about the characters that when all was said and done I practically agonized over what I could have done differently to possibly make things turn out just a bit better for some of the innocents along the way. The graphics had great style, the voice work is excellent, and the story is brilliant in its depth and execution. The puzzles are more along the lines of the ultimate evolution of a which-way book than an old school adventure game, but the way it all fits together and plays out is just this side of flawless. I can’t wait until the next episode. 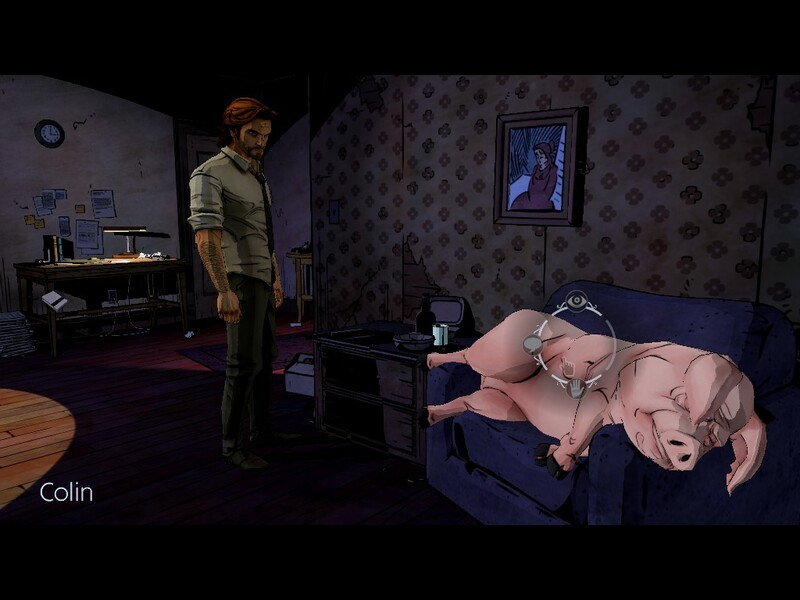 9.7 / 10: The Wolf Among Us has a fantastic setting and clever gameplay that makes it well worth playing and replaying. Hey, aren’t you supposed to be on the wall?